Pre-heat oven to 450 °F (230 °C). 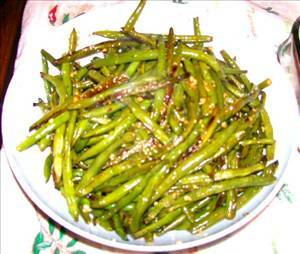 Toss green beans with olive oil on large rimmed baking sheet. Roast until browned and almost tender, stirring occasionally, about 10 minutes. Sprinkle beans with garlic, salt, and pepper; toss to combine. Continue roasting until beans are tender, about 2 minutes longer. 1533 members have added this recipe to their cookbook. I really enjoyed this one. Thanks for sharing. These were delicious!!! Next time, I will use less a little less oil, more garlic, and maybe a little chile powder. Very good, even the boyfriend liked! I added 4 slices of shredded pancetta and roasted along with beans. It took a little longer to lightly brown than indicated by the recipe. Beans were still crunchy. The family enjoyed these, it was quick and easy. We added a little more garlic than it called for since we are huge garlic fans at our house & LOVED it!! There are 65 calories in 1 serving of Green Beans with Garlic. Calorie break-down: 59% fat, 33% carbs, 8% protein.